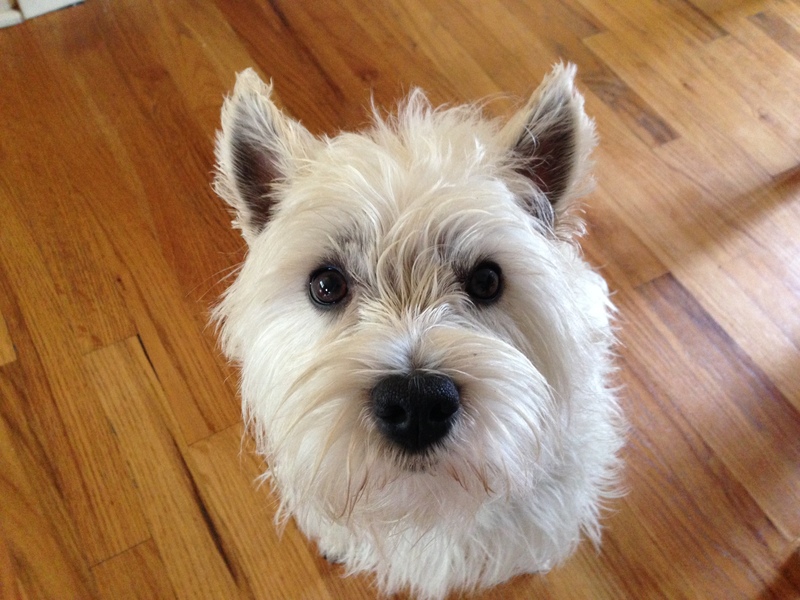 Ruby is a three-year-old Westie who has always been “grumpy” about her feet being touched (Guardian’s words). Ruby’s guardian called me for help as she seemed to have gotten increasingly sensitive about being touched, especially when laying on the top of the back to the couch. The reaction has progressively gotten worse as the dog now growl, bark and whip her head around, but has never actually nipped anyone. When I chatted with her guardian about the dog, she kept pivoting back to Ruby being a good dog when I asked if she had any rules, boundaries or how she corrected the dog. While Ruby is a good dog, she has some issues. Because the dog was more reactive when sitting on top of the back of the couch, I suggested that they make all furniture off limits for a while. Dogs relate some of their perception of authority based on how high they sit respective to the other members of the group. By sitting higher than anyone else, the dog was placing itself in the leadership position. This is why she had gotten more and more reactive to people coming too close or doing things she didn’t like. She thought it was her job to correct them. I showed her guardian how to communicate that the dog was to setoff the furniture on its own. When Ruby stood her ground, her guardian made things happen. While she said Ruby was usually obedient, she admitted that at times the dog only listened when it wanted to. By only asking once, then incorporating an appropriate consequence immediately, the dog learns that the human is going to get their way no matter what. So its better to obey right away and save the hassle. When the client brought out her ten month old daughter, Ruby walked up to her in a casual way, but proceeded to get right up in the child’s face. It wasn’t at all aggressive, but it was too close. If a dog climbs on top of or gets too close to a person without any regard for their personal space, its usually a sign of a lack of respect. But the real concern for me was the dog’s reaction when I used some body language to ask the dog to back away from the child. She let out a small growl while jerking her head down in a nipping movement. She stopped herself from making contact, but it was clear that she was defending her position near the child. Many humans find this endearing, but dogs correct their young much more harshly then we do. And if a dog is getting that close and disagreeing with other humans for trying to get between her, its a safe bet the dog thinks its at least a partial guardian of the child. If a dog sees itself that way, its not a stretch of the dog to attempt to correct the child from doing something wrong. In this case, a lack of rules for the dog likely influenced the dog to institute some rules of its own. I went over some new ways for the guardian to communicate with and disagree with the dog. By using body language, movement and positioning similar to how dogs do, we are using a language the dog “gets” instantly. To put these new communication methods to the test, I showed her guardian how to claim her personal space and disagree with the dog when it got too close to her. This same technique can be used to get Ruby to stop charging the door. Not only did the dog race ahead of her guardians to the door when people arrived, she jumped up on them. When a dog jumps up on a human who is arriving, its trying to claim ownership of the human and tell the human who is the boss of the house. This is just as bad as the dog deciding who can get close to the child. It illustrates that the dog thinks its equal to or superior in authority to the humans. When a dog thinks this way, its appropriate for it to show displease when a human does things it doesn’t like and in same cases cause the dog to bite to correct. I showed the guardian how to claim the area around the front door. By asking the dog to move back, the human can literally be in a leader position by standing in front of the dog. Most people pull their dog back or put it into another room to solve this issue, but that can intensify the dog’s reactions. By communicating to the dog that it needs to stay back, we can get the dog to do the work. This is a great way to help the dog practice self control. When Ruby ran to the back door and started barking at a squirrel she saw through the door, her guardian used the technique to claim the area around the door there as well. Each time she moved the dog away, then asked her to stay away on her own, the guardian was teaching the dog that she had things under control. In time this will result in the dog seeing itself as being there in a support capacity. There to follow behind the humans, but not try to correct them as they are the ones laying down the rules. By the end of the session the dog was listening better and looking at her guardian in a new light. She kept a respectable distance, looked to the human for cues and stopped trying to get up on the couch. With time, patience, supervision and practice at the little things, Ruby’s respect for her guardian’s authority will continue to grow. Once she sees them as her pack leader, she won’t think it would be appropriate to challenge them anymore.